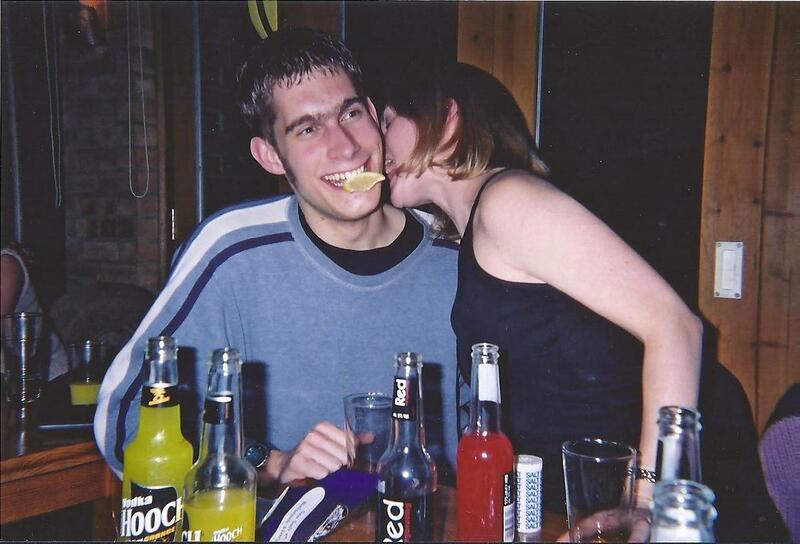 This picture was taken on New Year’s Eve in either 99/00 or 00/01. The pub is the Brewery Tap in Peterborough. I don’t recall the name of the young lady who was a friend of someone I was out with, probably from uni. We are engaging in a tequila body slammer. She is licking salt from my neck, will shoot her tequila and then grab the lemon from my mouth. There are several photos of various combinations of my friends doing this. As you can see from the table, this is not the first alcoholic drink of the night. There is also a photo of someone timing us whilst we swill something in our mouths – presumably AfterShock. If we say this was 2000 into 2001, then it was ten years ago. I now have less hair – bald patch, eyebrow managed by my wife and sideburns kept more trim (see this post). If I tried to drink those sweet sickly alcopops now (with the given you can no longer find them) I am sure that enter into some kind of sugar based coma. You are much more likely these days to find me with a pint of best bitter. So photos where it looks like I’m kissing someone I’ve only just met – a thing of the past.